South Korea's prolonged heat wave is producing a number of unusual moments, including a chick hatching out of an egg reportedly without a mother hen or brooder lamp -- thanks to the blazing heat and continued tropical nights. The country has been enduring unusually scorching weather for weeks since early July. Daytime highs exceeded 38 degrees Celsius in Seoul and other regions on Tuesday, while the temperature in Yeongcheon, North Gyeongsang Province, reached 40.3 degrees on the same day. As of Wednesday morning, 14 people had died due to heat-related illness, while heat stress has killed at least 1.43 million livestock. More than 1,300 Koreans have been medically treated for health conditions caused by the hot weather, including heat stroke. A series of rather unusual events have been attributed to the hot weather. In Gangneung, Gangwon Province, a chick was hatched Tuesday from a carton of eggs that had been placed in an outdoor balcony for a few days, a resident in the region claimed. According to Choi Ho-jun, 59, the Gangneung resident who now owns the chick, the egg from one of the chickens he raises in his backyard had never been brooded by the mother hen or placed under brooding lamps. The unusually warm weather basically did all the work, he said. Experts say for an egg to develop normally, it must be exposed for a considerable length of time to temperatures a few degrees below 40 degrees Celsius. Like many regions in Korea, Gangneung has been gripped by the heat wave, its day time highs reaching 35 degrees Celsius for most of the last two weeks. The city also experienced the country’s highest-ever morning low on Monday, at 31 degrees Celsius at 6:45 a.m. In Seoul, a glass window fell from the eighth floor of a department store on Tuesday, as the window’s silicone sealant reportedly melted in the blazing heat. No casualties were reported. A similar incident took place in police stations in Gwangju on the same day. A police officer suffered a minor injury from the accident. 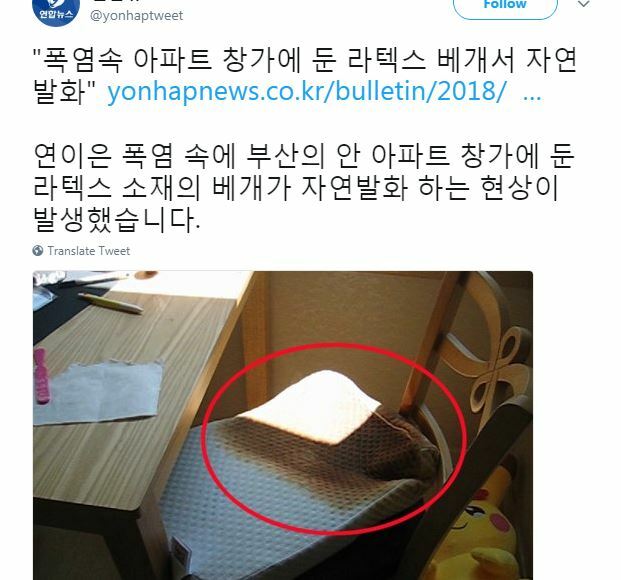 In Busan, firefighters responded after a latex pillow placed near a bedroom window burst into flames after being exposed to the blazing sunlight Wednesday. Authorities said the apartment owner’s neighbor called the fire department after noticing a burning smell. When firefighters arrived, more than half of the pillow had “naturally” combusted, as well as some portion of the chair on which the pillow had been placed. Latex pillows tend to absorb heat faster than others, and it is recommended not to leave them in the sun when the weather is unusually hot, firefighters said. The government has set aside an additional 6 billion won ($5.3 million) to help cope with the scorching weather, especially to look after those who are considered most vulnerable -- including elderly who live alone and those who do not have access to air conditioning. With damages and the death toll continuing to rise, President Moon Jae-in said Tuesday that he will push to revise relevant laws to recognize extremely hot weather as a form of natural disaster, so that the victims can receive compensation.